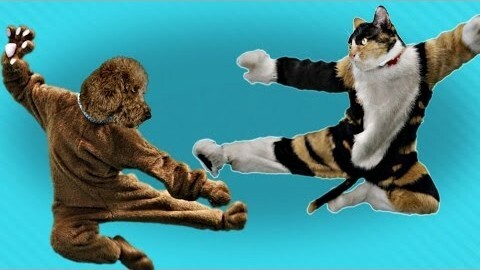 Special effects master Freddie W has delivered a double dose of Internet awesome in his latest video, mixing outrageous action with cute animals. In The Last Cat on Earth, the evil president Mr. Wiggles sends his best doggy SWAT troops to take out the last cat on Earth that is being protected by Jimmy Wong and the Resistance. Music is Don’t Let Go by Swiss American Federation. As the Internet continues to grow, so does cosplaying, an art form when fans dress up as famous fictional character, usually from the fantasy and action genres. This Japanese man in an Iron Man suit may have won the Internet and all cosplay competition till the end of time. His suit looks 100% Hollywood movie set ready, and it even has real moving parts! The face mask open and closes, the eyes even light up, and more! The video is going viral after being featured on Kotaku, Reddit, and IGN.